Tonight, the moon is full. 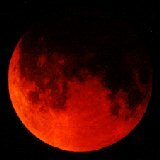 It is on the opposite side of the Earth to the Sun and, on this occasion, the three bodies are so precisely aligned that the Earth's shadow will fall on the moon causing a lunar eclipse. Unlike a solar eclipse, which can only be seen from places in the narrow path of the shadow, the lunar variety is visible from anywhere on the nightside of the Earth. More often than not, the Moon is not completely obscured, but coloured various shades of amber or red by light refracted through the Earth's atmosphere.